» Tigers and the Importance of Magic Outdoorsineering! Tigers want to eat you. And as any good outdoorsineer knows, they are very good at it (bad outdoorsineers will have been eaten by tigers and thus know nothing). Even in our modern age, tigers are the number one killer of adult men after heart disease and Chinese novelty toys. Tigers are proud and noble beasts. Growing to be over 600 lbs with canines1 up to 4 inches long, they are the undisputed kings of the jungles, forests, mountaintops, and bridges they inhabit. Nature has made them silent, nearly invisible, and deadly. Enjoying the leisure nature affords only to apex predators and the daughters of wealthy Jews, tigers have also developed a complex philosophic system some believe to be more advanced than our own. Don’t be fooled by the seemingly dumb cat napping in the sun at your local zoo. The tiger is simply developing elaborate logic matrixes that it will use to stump other tigers when it decides it has had enough of living in the zoo. Fortunately, like all wild animals, tigers love zoos (See An Introduction to Animals Worth Knowing). Fighting an enemy that is stronger, faster, and measurably smarter than man is no small challenge. For centuries, man did not even try. 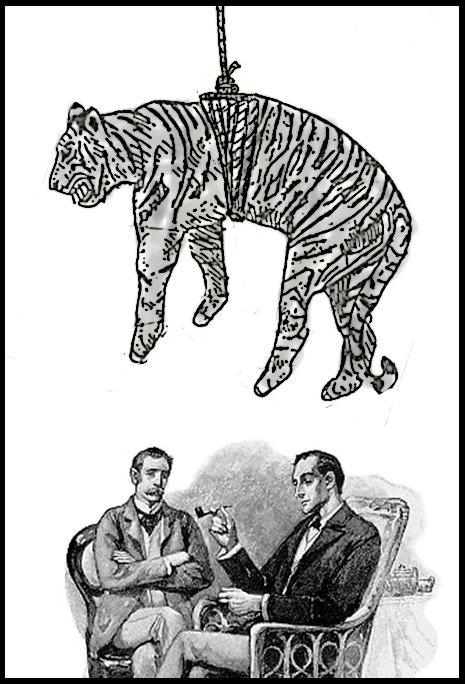 But the rise of modern society led to the rise of the tigers only known predator, the magician. A short visit to Las Vegas2 will demonstrate the magician’s dominance over the tiger. Taking advantage of the tiger’s reliance on logic, the magician perplexes the tiger with his illusions. Believing the magicians to possess logic even higher than their own, they will often bow to magicians perceived superiority. Of course, this puts the magician in a perilous position. If the tiger ever discovers the nature of one of the tricks, the magician will be immediately devoured3. This is important. In tiger country4, disguise yourself as a magician. A book of magic tricks and a top hat are essential pieces of outdoorsineering equipment and are more important than bottled water on most expeditions5. Now upon meeting a tiger, this book recommends against card tricks, as they are boring for both the outdoosineer and the tiger. Instead, try tricks where it looks like rabbits or people have died. Be forewarned, the tiger will only give you one chance to demonstrate your magic. Do not falter or you will be consumed! Here in an easy trick that should guarantee passage through tiger country6. When encountering a tiger, quickly put on your straight jacket. With arms bound, pull two rabbits from your top hat7. Kill the rabbits. Now, immerse yourself in the glass torture tank you previously hid in the forest knowing you would encounter the tiger. Appear to drown (If the trick is not going well, actually drowning helps sell the act). 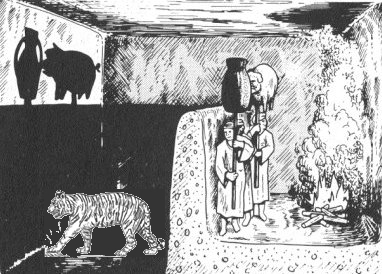 Using mirrors and smoke, escape from the straight jacket and torture tank, and reappear inside the tigers mouth. Bow, and give the tiger one of the dead rabbits. Keep the other for it’s lucky foot. Magic isn’t the only fun you can have with tigers though! Tigers are top-shelf and no outdoors adventure is complete without at least one tiger encounter. But sometimes there are not enough tigers around. As you grow into your outdoorsineer persona, you will learn that this is not a problem. In fact, it is general practice for an outdoorsineer to raise tigers in secret, only to unleash them upon other outdoorsineers at critical moments in their outdoorsineering. For instance while the outdoorsineer is rappelling from a great height or scuba diving. My personal favorite is to spring my surprise tiger on a fellow while he is already engaged in fighting a tiger. This is considered great sport and extra outdoorsineering points are awarded for creativity8. Raised in a pit full of badgers and screaming you say? Let's hope he never discovers the skylight. Here is one of my favorite stories. Once while hiking I came across what I thought was a tiger on the trail. I immediately prepared my magic only to discover it was not a real tiger at all, but a stuffed tiger. Feeling safe I continued only to realize that is was not a stuffed tiger, but a real tiger wearing a stuffed tiger costume! Zounds was I surprised to feel the double jaws of the stuffed real tiger on my throat. Thankfully, I had a never-ending kerchief in my sleeve. I used it to lasso and kill a rabbit, which, using mirrors and smoke, I reappeared inside the tiger’s mouth. I have not yet discovered which outdoorsineer played such an excellent tiger prank on me but I have been raising a tiger cub in a pit full of badgers and screaming for the day we meet.